Each year, we offer opportunities for several select students (who are enrolled in art) to take after school classes with some of the amazing art organizations near Maggie Walker. This helps our students develop their portfolios by learning skills and techniques that we often are unable to teach at Maggie Walker. 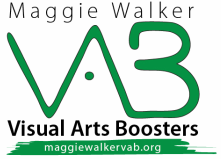 The Visual Arts Boosters help subsidize the cost of the classes. The total cost to students is only $20!! Students are responsible for transportation to and from class. Locations will vary between local art centers that are close to school (The Glass Spot, the Visual Arts Center, etc.). Applications are available @ school and via email/social media. Student selection is based on grade level (priority for Juniors/Seniors), the number of consecutive years enrolled in art classes, earned grades in those classes, interest as demonstrated through the application, and overall commitment to their art and to the art program at Maggie Walker. #1: Our first pARTnership of the year is with Studio Two Three, a printmaking cooperative founded by a Governor’s School Alumna. If you are interested in pARTicipating, please complete the application and return to Coach Hall by Friday, Oct. 19th. Five to six students will be selected and informed over the weekend.